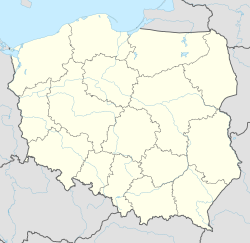 For other places with the same name, see Krynica (disambiguation). Krynica-Zdrój [krɨˈɲit͡sa ˈzdrui̯] (until 31 December 2001 Krynica, Rusyn: Крениця, Ukrainian: Криниця) is a town in Nowy Sącz County, Lesser Poland Voivodeship, Poland. It is inhabited by over eleven thousand people. It is the biggest spa town in Poland often called the Pearl of Polish Spas; and a popular tourist and winter sports destination situated in the heart of the Beskids mountain range. Krynica was first recorded in official documents in 1547 and became a town in 1889. Due to its convenient location, infrastructure and rail connections with major cities in Europe, Krynica-Zdrój (Zdrój means mineral spring in Polish) was the location of winter sports tournaments during the interwar period, including the 1931 World Ice Hockey Championships, the 1958 and 1962 FIL World Luge Championships, the 1935 FIL European Luge Championships and the 2004 Euro Ice Hockey Challenge played in the town. A gondola lift built in 1997 on the Jaworzyna Krynicka mountain overlooking Krynica, and subsequent investment in modern skiing facilities (apart from the former track of bobsleigh) made Krynica one of the most important ski resorts in Poland. Nearby Beskid Sądecki mountains are also a perfect setting for recreational cross-country skiing in winter and mountain-biking in summer. The winter sport of bandy returned to Poland ine the 2010s, after many decades. When the country made their first international appearance in 2006 at the World Championships for boys U15 in Edsbyn, Krynica-Zdrój contributed with most players. Krynica was home to Nikifor (birth name Epifaniusz Drowniak), a famous naïve painter in communist Poland. Krynica is sometimes nicknamed "Eastern Davos" for the Economic Forum held there each year in September. Politicians (including heads of state) and businessmen from several countries of Central Europe, Russia, Central Asia and the Middle East meet there to discuss economic and political matters. Also, part of the inhabitants of Krynica belong to the Lemko minority who speak an Eastern Slavic language called Rusyn. ^ Bandy World Championships 2006: Poland roster. Homepage. Wikimedia Commons has media related to Krynica-Zdrój.